Indonesia is an exciting market. The demographic composition has great economic potential. The large and young population as well as the growing consuming power of the middle class make this archipelagic state a perfect market to enter and start their startup adventure. Ideal and desirable as it sounds, that is not entirely correct. Statistics and reality are totally different matters. We, thereby, would like to share some hidden truth behind the statistics and, hopefully, help more entrepreneurs understand the real Indonesia startup scene. Given the huge market potential and increasing spending power, it’s undeniable that Indonesia is one of the final gold rush sites that catch tons of international investors’ attention. Fresh capital is instilled to the startup arena and awaiting potential investment targets. Surprisingly, the lucrative opportunity in Indonesia is not as ideal as widely imagined. Indonesia disappoints foreign investors with ever-changing business regulations and ongoing instability of labor. Despite possessing many amazing budding startups, the extensive uncertainty makes foreign investors becoming indecisive and hesitant. Worse still, Chinese investors have marched to Indonesia much earlier and come with a higher magnitude of capital than other foreign investors. They have infiltrated massively and hold a strong control over the Indonesia startup ecosystem, leveraging their influence on the entire nation to favor Chinese companies. Undoubtedly, the ever greater risks originated from the Indonesia government and Chinese capital pose a huge threat to foreign investors. While the entire startup ecosystem in Indonesia is experiencing the fast-growing period with foreign capital continuously coming to this region, looking for the right talent, especially with engineering background and sophisticated marketing professional, becomes the harsh difficulties to handle. Noticing this issue beforehand, local unicorns and big corporates have deployed their network and capitals to start recruitment in response to today’s situation, which makes it harder for budding startups without strong capital backup to compete with. Consequently, startups that can’t offer equivalent perks as decent as big companies might be unable to survive in the increasingly competitive market. This issue, inarguably, poses a huge threat to the coming future of those budding startups in Indonesia. Edison Chen(left) was explaining to the audience. Blockchain is one of the emerging and promising technology that is expected to bring a revolutionary impact on the entire startup ecosystem. Many Indonesian teams have been working on discovering potential utilization in different fields since the beginning. While the topic of Blockchain is getting ever popular and there are several associated communities constantly advocating, nearly all of the solutions on a variety of issues haven’t got tractions in the market or doesn’t have problem-solution fit. Blockchain becomes the buzzword that everybody talks about to attract investor’s and public attention, exactly like artificial intelligence awhile back. With that said, it wouldn’t be fair if we blame the stagnation of blockchain utilization in Indonesia on startup teams. This issue has a lot to do with the blockchain infrastructure and user base. Indonesia and this blockchain-based startup just haven’t had reached the critical mass point where their product can function properly and ideally. 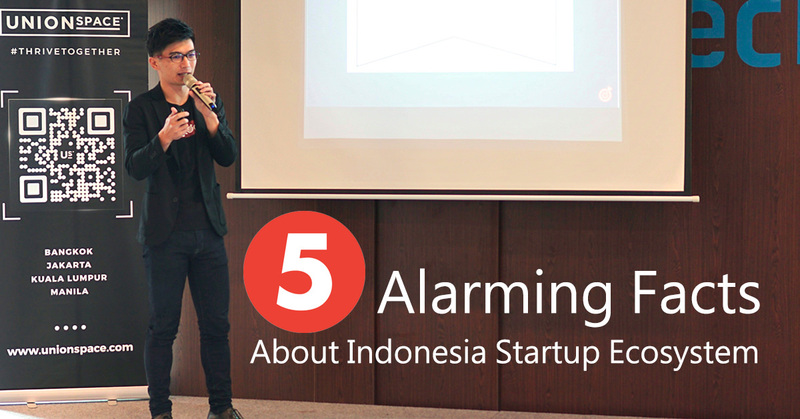 Indonesia startup ecosystem is becoming increasingly vibrant and diversified. It’s exciting to see more Indonesian enthusiast and entrepreneurs joining the harsh journey with determination. Nevertheless, Indonesian entrepreneurs aren’t the only one striving to dominate the huge market. Foreign startups coming from around the worlds, such as Singapore and Korea, are swiftly mushrooming up and leading the startup ecosystem with their successful experience in other countries. The topic these foreign startups present include native advertising networks that provide better user experience, integrated platform that allows clients to track offline behavior, and other creative innovation that is possibly able to disrupt the startup scene. Indonesian startups, on the other hand, seem to be staying at the early stage where most startup founders competed with one another on the same common topic and tried to build up a two- or multi-side platform, which the pioneer advantage has disappeared long before. E-commerce growth in Indonesia shows no sign of stop. Revenue is expected to perform an annual growth rate (CAGR 2018-2022) of 13.0% and user penetration is expected to hit from 40.0% in 2018 to 48.3% by 2022, according to Statista. In spite of the amazing forecast of growth, it’s widely believed online marketplace, such as Tokepedia and Bukalapa, account for the majority of the figure. Indonesian e-commerce will remain the battlefield for the big names only and leave no rooms for vertical e-commerce in the following years. Launching shops on online marketplaces is a good start but never a wise decision for the long m term goal. The inherent disadvantages of price competition, data collection, and scalability would significantly crash entrepreneur’s business badly at some points. Most entrepreneurs, instead of allocating resources to build up their own vertical e-commerce and eying on the future, continue paying all the attention to online marketplaces, which barely creates desirable margin and develops longstanding brand loyalty. Indonesia, undoubtedly, is no longer where people perceive as an underdeveloped region. In the startup ecosystem, however, there is still a long way to go. The aforementioned hurdles is what you can not easily find out based on the statistics of reports.